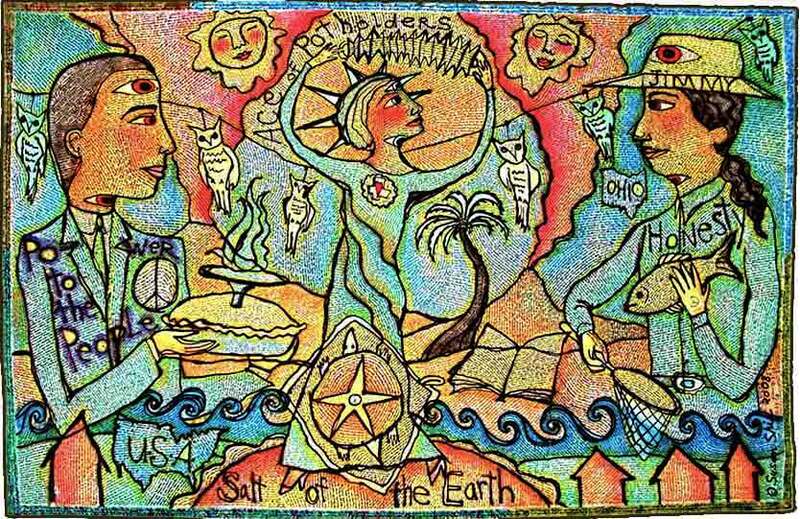 Salt of the Earth - The Ace of Potholders by Susan Shie, ca. 2008. 500 people in our community are currently praying with you. O blessed Christ, my teacher, my savior, my God: You have commanded me to love others as myself. Yet it is so often easy to see the faults in others, for I see their outside and compare it against what is inside me. I have inflated my goodness and importance in my own mind, but have judged others for the smallest shortcoming, and I am filled by foolish pride. 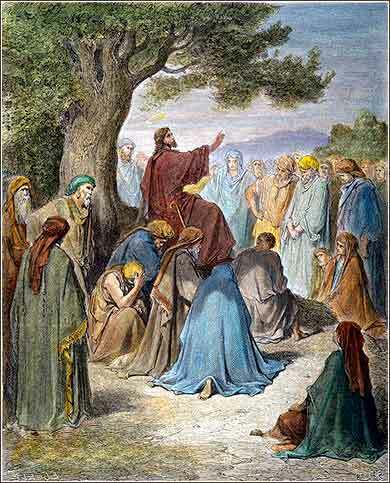 Jesus Preaching, tinted etching by Gustave Dore, ca. 1875. Standard Christian theology, and Paul himself (2 Timothy 3:16), inform us that the Bible is “inspired”, but “inspired” means something very different than its everyday usage. It is a technical term, a translation of a Greek word that means, literally, the breath of God. The Bible is not a human work. The author is God; the function of Matthew, Paul, et al., is not authorial at all, but secretarial. At no point is this clearer than in Matthew 5, where Matthew has recorded the words of Jesus; not the figurative breath of God, but the literal breath of Christ, God made human. But there is a rub. As previously discussed, what we are reading has been translated at least twice. We may credit Matthew's own translation of Christ's Aramaic words into Hebrew as inspired Scripture, but the later translations from Hebrew to Greek, and then Greek to English, create problems. First, they are the work of human beings — very smart, pious, educated human beings who often dedicated their lives to making the translations; but nevertheless, fallible humans. Second, the languages involved are very different from each other, and even worse, the Hebrew and Greek are ancient Hebrew and ancient Greek. There are, literally, words in the Bible that nobody alive knows what they mean. And third, some of the Bible is written in idiom. If you have ever studied another language, you will know how difficult it can be to translate an idiomatic expression. It is impossible to both translate the words and also convey the gut-level meaning, the impact that the expression would have on a speaker of the original language. You might tell a non-English speaker that “Paul hit a home run” means “Paul did very well”, but it loses something in the translation. Today we have a perfect example. The metaphor would have been powerful and struck an immediate chord to the Jewish listener 2,000 years ago. But to us, it is awkward-sounding; we have to work at it to get as much of the meaning as we can. Salt has two primary functions. It makes food taste better; most kitchens today have salt in them for that reason alone. But even more important, to people who have neither cans nor refrigerators, is its power to preserve food from spoiling. The significance of salt to ancient peoples was enormous. It could mean be the difference between life and starvation. And knowing this, when we also consider who it is that Christ is addressing, the meaning becomes clear. At the time, the salt of the earth would be the Hebrews, for it is they who preserve the word of God for the benefit of humanity. But they have lost their love of God in their hearts, and Judaism has become a formalistic religion where love of God has largely been lost to politics, greed, and personal ambition. Christ is telling the crowd that Judaism has become worthless. It is form without substance, salt without saltiness. The law of Moses, without love of God in one's heart, has no value and needs to be discarded. It has proven incapable of performing its function. And this leaves the rhetorical question: How is its saltiness to be restored? How can a religion that has lost its Godliness be renewed? The answer, as we know, will not be given simply in words, for the answer is standing before them in flesh and blood. Matthew 6:3-4: When you give to the needy, do not let your left hand know what your right hand is doing, so that your giving may be in secret. And your Father who sees in secret will reward you.